This durable and accurate 5,000 pound capacity industrial-duty floor scale should be on your short list when comparing your options for weighing, The TS5-33-C comes complete with weighing deck, digital indicator and all required cables and cords. Made to last, it boasts an outdoor rating. 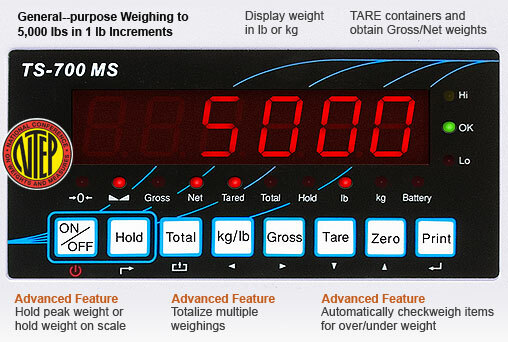 Like other models from Floor Scales Direct, this one is factory calibrated and ships ready to connect and use. For more information, click on the tabs below or contact us. Were here to make sure you are 100% satisfied with your purchase. The weighing deck of this floor scale is NTEP certified. Features include diamond plate top deck, self-leveling, shock absorbing feet and mild steel junction box. The digital indicator is also NTEP certified. Features include a bright, easy-to-read backlit LCD display, NEMA 4x watertight stainless steel construction, internal rechargeable battery, advanced functions and basic functions.